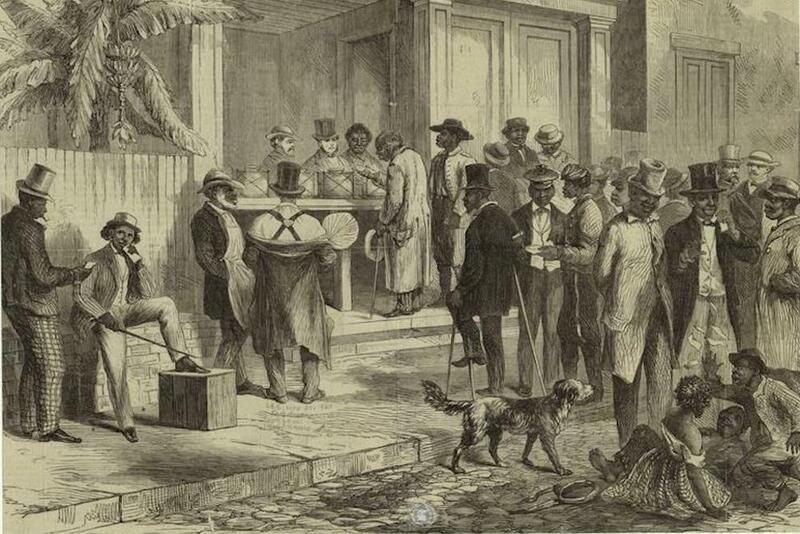 An 1867 illustration depicting freedmen voting in New Orleans. Courtesy of Wikimedia Commons. The American problem with voter suppression started with a void in the original Constitution, which did not include a right to vote. This omission allowed states to suppress the votes of non-whites by various means. In the antebellum period, the pattern of suppression was deregulatory and explicit, as Americans pursued the ideal of a “white man’s republic.” States expanded the franchise for white males by eliminating property and tax-paying qualifications for voting, while at the same time explicitly excluding women, Native Americans, and African Americans. In 1800, only five of 16 states mandated white-only voting. By 1860, 28 of 33 states, comprising about 97 percent of the nation’s free black population, had adopted such racially restrictive suffrage. In 1860, no state imposed property qualifications for voting and only a half-dozen had tax-paying requirements. As the winners in this new political order, white men shaped the nation’s laws and policies without regard to women or minorities. This shift in voting rights did not occur without challenge. In Pennsylvania, in 1835, William Fogg, an African American whom election officials had turned away from the polls, filed America’s first voting rights lawsuit. This idea of excluding blacks from the “social compact” reemerged when Pennsylvania adopted a new constitution in a convention that began on May 2, 1837, and lasted until February of the following year. This 10-month deliberation took three times longer than the convention that drafted the nation’s constitution in Philadelphia in 1789, and its delegates played on the common prejudice that African Americans lacked the moral and mental fitness needed for suffrage. They charged that unscrupulous men of wealth would buy the black vote and corrupt elections with voter fraud. They raised the specter of blacks flooding into states not just to vote, but also to hold public office. A whites-only suffrage, they argued, would preserve the integrity, independence, and virtue of the vote. In 1800, only five of 16 states mandated white-only voting. By 1860, 28 of 33 states, comprising about 97 percent of the nation’s free black population, had adopted such racially restrictive suffrage. Such appeals proved unavailing in Pennsylvania and across America. Without a guarantee of the vote in the U.S. Constitution or any federal voting rights laws, the disenfranchised black people of Pennsylvania and other states had no recourse to any authority higher than their discriminatory state constitutions and hostile state courts. This represented a serious retreat for the country. In the 18th century, African Americans who met other qualifications could vote in most states of the new republic. But by the mid-19th century, those suffrage rights had been lost. The Civil War changed that. After the war, African American men regained the right to vote—only to lose those rights within decades, after Reconstruction. The Fifteenth Amendment did pass in 1870, but it did not explicitly grant voting rights to minorities, it only prohibited the states from denying the right to vote based on race, color, or condition of previous servitude. After Reconstruction, states evaded the Amendment with seemingly race-neutral laws such as literacy tests and poll taxes. It would not be until 1965 that African Americans and other racial minorities regained the vote with the passage of the Voting Rights Act. But in the 2010s, our current decade, the U.S. Supreme Court overturned a piece of the Voting Rights Act. And struggles for full access to the ballot continue, with states restricting voting opportunities through measures such as photo voter ID laws, voter purges, felon disenfranchisement, polling place closings, and gerrymandered legislative districts. Although the players and the issues in voting rights may change over time, today’s arguments would seem familiar to those involved in the antebellum fights over voting. And the stakes are very much the same: Who has the right to vote in America and who benefits from exclusion? 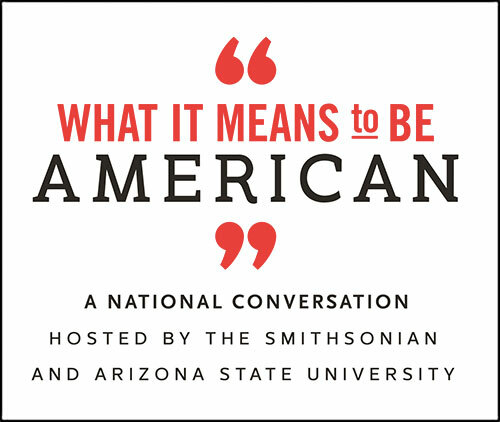 Allan J. Lichtman is Distinguished Professor of History at American University in Washington, D.C. and author of The Embattled Vote in America: From the Founding to the Present.